Netherlands-born contemporary jewellery designer, Alissia Melka-Teichroew, is the founder and creative director of New York design studio, byAMT. Her collection of jewellery – Jointed Jewels – consists of ball-and-socket joints, akin to those usually found in joint replacements. They have been created using a 3D-printing process called selective laser sintering (SLS), where one ball is literally printed inside another. Jointed Jewels represents a union of new and old, organic and industrial, functional and decorative. Hence, the industrial connecter was transformed into an object of beauty and wonder. 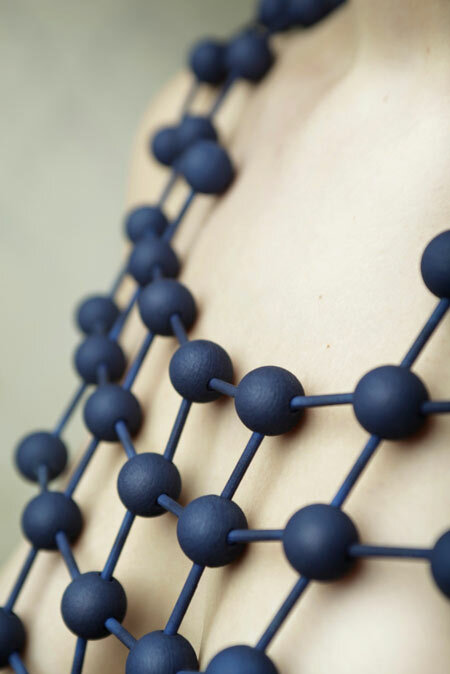 A clean and striking jewelry collection was created around this innovative concept. Each piece has been made with the same technique: it seems like an intricately assembled object but is in fact one single piece that was made in one go. Although the jointed pieces share the same birthing process, each item has a different identity. Many of the bangles, necklaces and rings are interpretations of renaissance and Victorian jewels and there are also references to intricately made and very precious pieces by luxury brands like Bulgari and Cartier. This entry was posted in Contemporary jewellery design, Uncategorized and tagged Alissia Melka-Teichroew, Netherlands, paper, selective laser sintering, SLS by fidunfi. Bookmark the permalink.